The Law College has its wonderful building in the C. S. I. Compound, Bangalore. 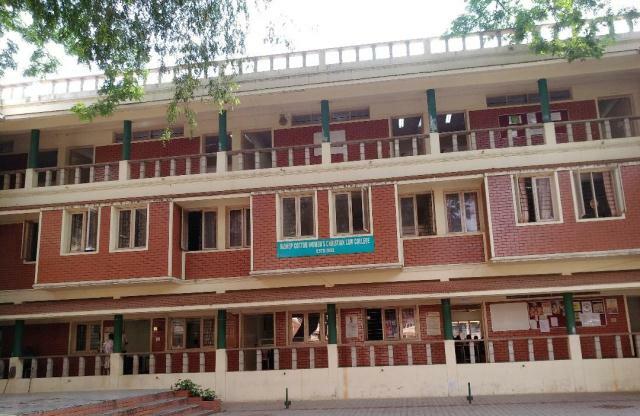 It is provided with a well equipped Library, a classically designed Moot Court Hall, a posh Auditorium, a self contained Staff Room, spacious Class Rooms and a Computer Lab. 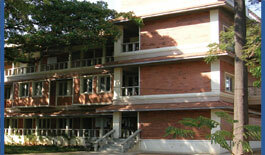 Working hours of the college is from 8.15 am to 3.30 pm from Monday to Friday and from 8.15 a.m to 1.00 pm on Saturday. 75% attendance is compulsory, in case attendance is below 75%, student will not be allowed to appear for the examination. Students must always carry their Identity Card. The same must be produced if demanded by any college authority. Students must observe discipline in the college premises. Students are not allowed to carry Mobile phones, valuable items in the college premises. In case of any loss college will not be responsible. All Students should come in their uniform. Students should wear white top, black bottom and black dupatta. Black pants and white tops may be worn on Tuesdays and Thursdays. Fourth and Fifth year students should wear white bottom, white top and blazers when they visit courts for Practicals. Students who are not conforming to this may be required to leave the College for the day. For non-observance of above mentioned rules and regulations, the students will have to pay fine as per college norms. There will be four houses namely, Blue Bells (Blue), Calendula (Orange), Daffodils (Yellow), Gladiola (Red) and Magnolia (Pink). Each house will have a captain and vice-captain. The houses will have activities like seminars, debates, moot courts, games, quiz and other things. There are five clubs. Each club will have a President and a Secratary who will be elected. All the students of IV and V year of BBA. LL. B. and II & III year of LL. B. will be the members of the Legal Aid Club. The students can become members of any of the other clubs like Environment club, Social Service Club and Fine Arts Club. All Christians will be the members of Deborah Club and Student Christian Movement. 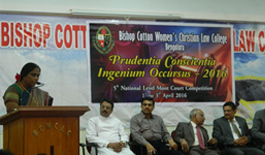 Bishop CottonWomen's Christian Law College conducts National Level Moot Court Competition under the name "Prudentia Conscientia Ingenium Occursus" (meaning 'wisdom, knowledge and talent meet) in the last week of March (last Friday to Sunday). Moot courts are artificial courts where the student lawyers are given the set of facts of a particular case which involves the dispute to be solved by employing the knowledge of law. Thus this practical experience of employing law in courts during the student’s life imbibes the qualities of a lawyer in the law student. 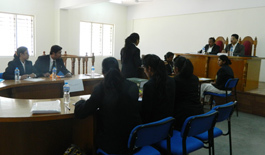 The student represents the College in various national level Moot Court competitions. 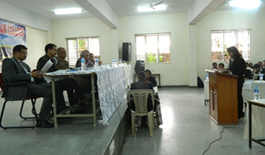 We hosted Stetson International Environmental Moot Court Competitions- South India Rounds in association with Surana and Surana International Attorneys, Chennai from 6th to 8th November 2009. Around 30 Colleges Participated. Legal Aid Clinic functions third Saturday in the college and free legal aid is given. Legal Awareness Camp and Legal Aid Camp are conducted every year. Students of lV & V year of BBA. LL. B and II and III year students of three year LL. B. visit prison every Saturday in batches. 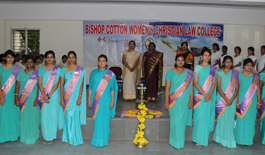 Bishop Cotton Women’s Christian Law College's graduate will have the benefit of a special placement guidance cell, instituted by the College to ensure that potential students are placed to their choice. The College is also keen on providing a tailor made. programme for each student according to her talents and intelligence. Placement Cell also provides the scope to the student to do internship with Law firms and Advocates. The most prestigious award is the “Best Law Cottonian” award which is given to an overall student who excels in academics, takes active part in co curricular activities (Sports, Moot Court competitions, Seminars, Camps, NSS activities etc) and extra curricular activities (Fine arts, various competitions etc) exhibits absolute and perfect leadership skill and builds up a good rapport with people all around. The outgoing members of the college Union and the hostel leaders are also given awards. College Day will be held in the month of September every year. The topper in the University Examination in each semester will be honoured with a gold medal. The student with the 100% attendance will be given a silver medal. Annual Sports Day is held in November or February. Facilities for indoor and outdoor games are available. Students from all the five Houses take part. Winners and Runners up in various games and athletic events are awarded prizes. Individual championship and House championship are also awarded. Rolling shield is awarded to the best Marching House.